If you have been reading our columns long enough, then you know how fond we are of the 19th century Hudson River School of Landscape Art. Many geologists share our enthusiasms; those fine old artists captured their landscapes in a way that strikes a chord with all of us. We look at their paintings and our hearts beat as one with theirs. We have been longtime members of Cedar Grove: the Thomas Cole Historic Site. It is devoted to the study of this art. Have you been there? Let’s give you a good reason to go. All summer, there will be a fine exhibit of about 20 paintings by Sanford Robinson Gifford. 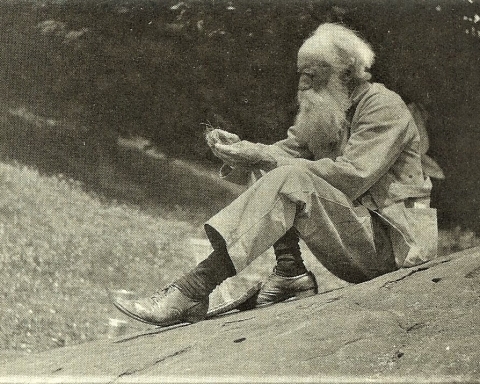 Gifford was one of the leading lights of the Hudson Valley School. We have long admired his paintings so you can imagine how happy we were to hear of this upcoming event. The paintings on loan are, many of them, from places like the art galleries at Harvard and Yale Universities, along with The Albany Institute of History and Art. Others, however, are from private collections so they are only rarely seen. It has been curated by Dr. Kevin Avery, Senior Research Scholar at the Metropolitan Museum of Art. Dr. Avery has done Gifford exhibits in the past so he is eminently qualified. The exhibit will be housed in the recently reconstructed “New Studio” where Thomas Cole painted during the last few years of his all too brief life. The New Studio has been outfitted to accommodate important exhibits of this sort. In short, this is a major event; so many of you will want to see it. We, of course, are drawn to all of the scenic landscapes portrayed in the exhibit. But, as geologists we can see things that others miss. We would like to pick two very special paintings and describe them today. 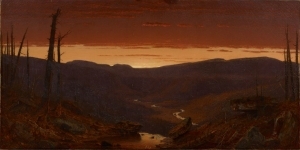 The first is entitled “Twilight in the Catskills” and was painted by Gifford in 1861, before he entered service with the Army of the Potomac in the Civil War. The painting had been lost and only in recent years was it rediscovered. It’s a sizable canvas, measuring 27 by 54 inches. 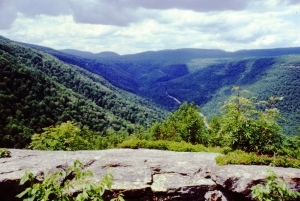 It is a view sketched from the eastern end of Kaaterskill Clove. The artist gazed out across the whole Clove and painted it at, of course, twilight. When you look at it, you have to think of Frederic Church’s “Twilight in the Wilderness.” The two paintings share a common color and atmosphere. You look at the painting and you are looking up the canyon. In the far distance you can see the familiar silhouette of the Clove. In the center you can pick out the location of Haines Falls. 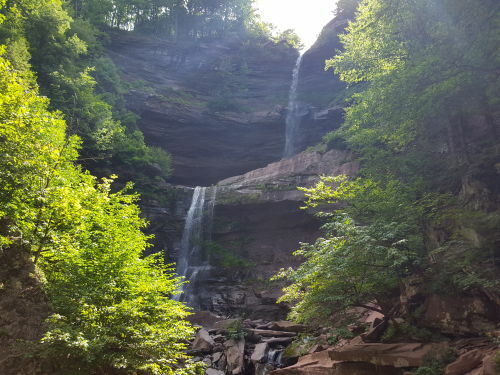 To its right is the canyon that descends from Kaaterskill Falls. Further to the right, is the rim of Kaaterskill Clove, a location where today is found the famous Rim Trail. Would you like to visit the site where Gifford worked? Would you like to go there and see what he saw – perhaps exactly what he saw? Well, we think we can help. 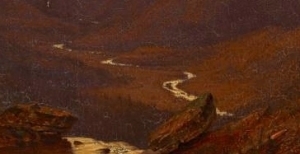 The painting shows a ledge of rock in its left center foreground. There is a flow of water running across that ledge and the rest of the clove was painted from that vantage point – the top of a waterfall. We believe that this is the site of the top of Hillyer Ravine, which you can find on the New York/New Jersey trail map, Ninth Edition, Trail Map 141 for the Northeastern Catskills. To get there you must find a legal place to park in Palenville (not easy) and hike up the Long Path Trail. Follow that trail until you get to the top of Hillyer Ravine. It’s an ascent of about 1,500 ft.
We have not been able to do this recently; it has, after all, been winter, but, anyway, we have a better idea. Along the way, you will find a sign pointing you in the direction of something called Poet’s Ledge. The yellow trail descends down a slope and brings you to the ledge. There you will see something very akin to what Gifford saw. See our second image. Compare our photo with his painting; look carefully and you will see a difference. 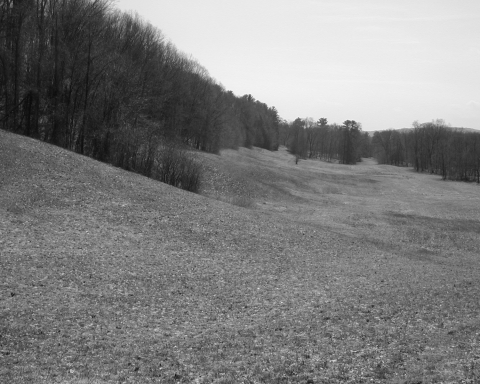 Our photo shows a consistently deep and narrow valley bottom. That is typical of a mountain stream; they are very erosive and always carve deep, narrow valleys. But, look at Gifford’s painting again (our detail, presented as our third image). 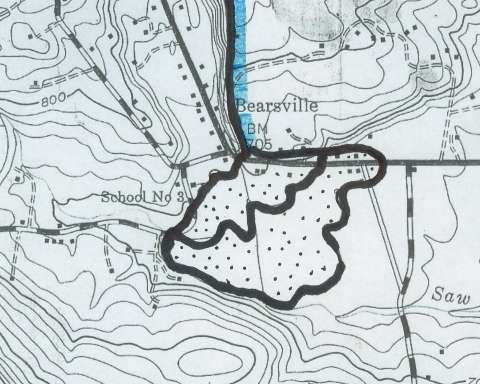 Gifford has put a floodplain at the bottom of his Kaaterskill Clove and he has added a meandering stream. Few would notice this, but to trained geologists this is a glaring inconsistency. Meandering streams are never found in mountain valleys. 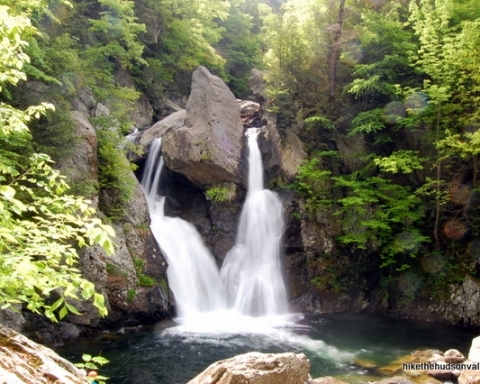 We have showed this image to some of our hiking buddies, people who know their ways around the Catskills. They quickly point out how Gifford’s meandering stream reminds them of the upper reaches of Schoharie Creek, just to the west of Plattekill Clove. We agree with them; we had thought the same. So, in the end, we are accusing Sanford Robinson Gifford of cheating! He painted what he wanted to see, not what is actually there! We forgive him; it was for the purpose of creating fine landscape art. And, it that, Gifford succeeded. He and we are still friends. Let’s pick another very special painting and describe it today. 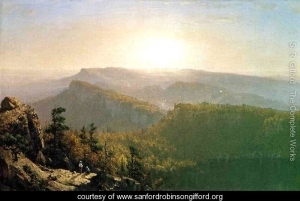 This one was done outside of the Catskills; it’s entitled “The Shawangunk Mountains” and was painted by Gifford in 1864. It’s a small painting, measuring only 9 by 16 inches. It is a view sketched from the very center of the mountains. The artist gazed out across the whole of the southern Shawangunks and painted what he saw. You look at the painting and you are looking into the very structure of the Shawangunk Mountains. Great ledges of gravelly sandstone tower above the Hudson Valley. These are massively stratified rocks, with horizons leaning back to the right which is the west. The Shawangunks are composed of a relatively pure quartz sandstone and that is a rock which is resistant to all sorts of weathering processes. That’s why those ledges stand out so clearly and that is what must have attracted the artist. Would you like to visit the site where Gifford worked? Would you like to go there and see what he saw – perhaps exactly what he saw? Well, we think we can help. You will have to visit the Mohonk Mountain House Hotel and find your way to the Sky Top Tower. That won’t be hard; the tower is enormous; it rises high above this lofty part of the Shawangunks. You look south and you should not have much trouble seeing something very akin to what Gifford saw. Gifford got there years before the hotel was built and, of course, many more years than before the tower. That site lies at the top of a sizable ledge so it must have long attracted the attentions of outdoorsy people. That has probably long included artists. When we were there the last time, we saw some artists sketching right there. But the painting at the exhibit will not be a sketch; it will be one of the classics among those painted by the Hudson River School artists. Contact the authors at randjtitus@prodigy.net. 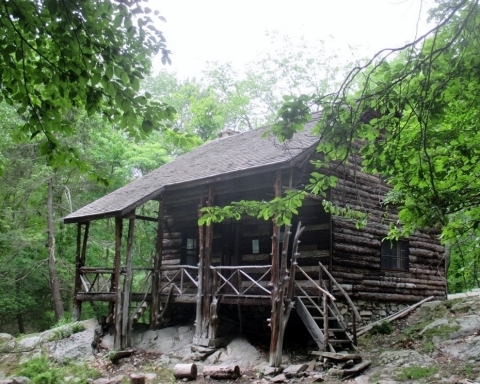 Join their facebook page “The Catskill Geologist” or log on to their blog site thecatskillgeologist.com.